On New Year's day we had time for a quick drive up a nearby canyon to see some of our favorite sights. We're still spending more time unpacking and getting settled in at our new place than we are playing and chasing birds, but luckily we live really close to some of the best birding hotspots in Ada county. 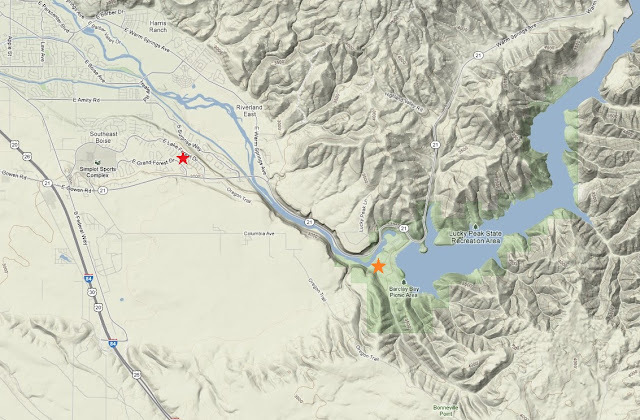 Our neighborhood indicated by the red star, Foote Park indicated by the orange star. Southeast Boise, Ada County. We didn't really have any target birds in mind, we were just excited to be back in town and hanging out on our old stomping grounds, but we managed to stumble upon a Golden-crowned Sparrow mixed in with a flock of White-crowned Sparrows and Dark-eyed Juncos. Golden-crowned Sparrow. Foote Park, Ada County. January 1, 2013. Golden-crowned Sparrows are a review species in Idaho, and eBird's filters took notice. 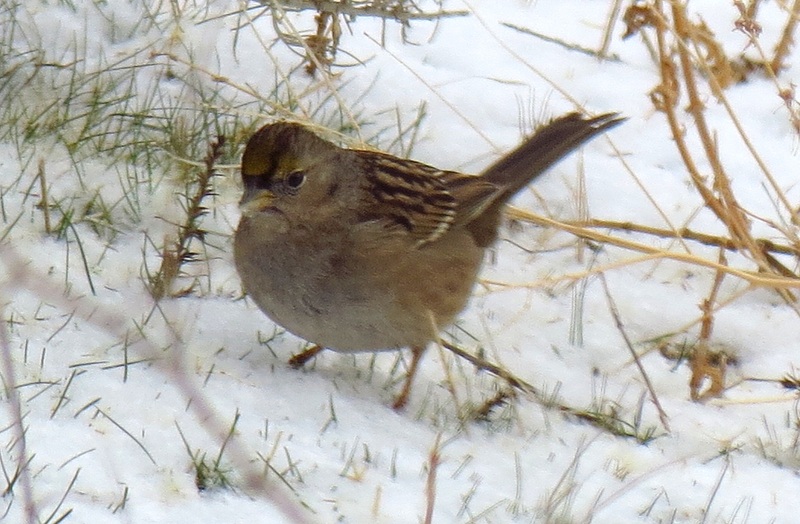 Turns out that eBird doesn't have any records at all for Golden-crowned Sparrow in Idaho in January. eBird's bar chart for Golden-crowned Sparrow in Idaho. I'll be submitting my first rare bird report to the Idaho Bird Records Committee at the request of Lew Ulrey, one of the Treasure Valley's most dedicated eBirders, and regional reviewer for Ada County. I've seen a fair number of review species before, but never took the extra step of submitting a report (except to eBird). Lew indicated that he would wait to hear the IBRC's action before confirming my sighting in eBird. That's the first time I've had an eBird reviewer tie an eBird sighting confirmation to the action of a records committee. A lot of people have strong opinions on records committees (some very supportive, some not as much). I probably tend to land somewhere in the middle. On the one hand, my personal enjoyment of a sighting is not dependent on what anybody else thinks of the bird's status, so I have no real interest in whether a report gets accepted or not. On the other hand, if I'm going to tick Golden-crowned Sparrow off my Idaho list, I'd like to know I have actually seen one. If the more experienced birders on the records committee point to some other ID for my bird, I'd rather know that and hope for another sighting down the road, rather than check something off I didn't actually see. I do think that Golden-crowned Sparrows are probably under-reported in Idaho. After all, how would these west coast residents manage to stray as far east as they often do without at least a few of them passing through Idaho? I would guess that many of the birds that pass through are missed simply because it's a much less populated state than many others, and there aren't enough birders out and about every day to notice them as they pass through.